About 150 km from Hanoi, Mai Chau is one of the best places in Vietnam for trekking fans. This beautiful valley is home to the Muong and White Thai people, some of the loveliest and friendliest people anywhere. Depart in the morning, stroll along winding roads through fantastic mountain landscapes full of rice fields and ethnic villages. Mai Chau is an ideal place for both light and heavy treks and this Vietnam trekking tour is perfect for those who wish to soak up the peaceful and authentic atmosphere of the most scenic mountainous close to Hanoi. 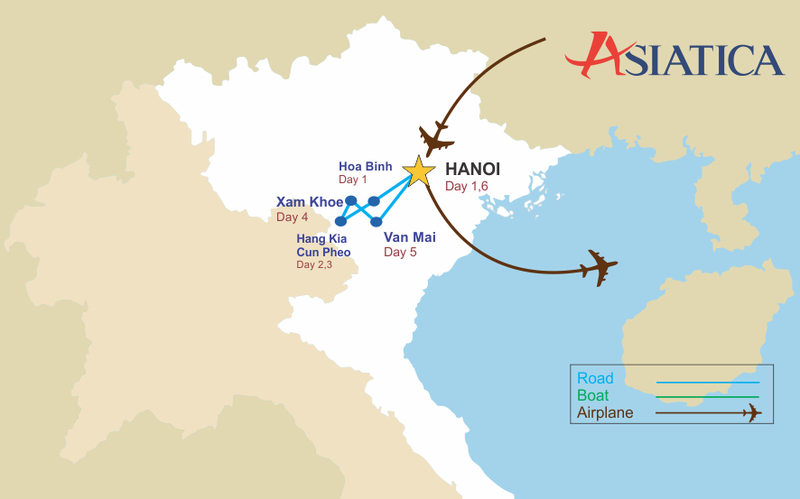 Join us in discovering the rugged beauty and exotic culture of North Vietnam! Homestay: Communicate with local people, explore their tradition and customs by participating in their daily life and share your meals with them. 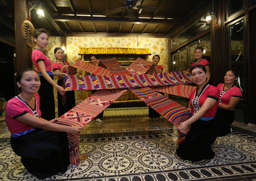 This trip is ideal for those who appreciate an authentic travel experience. The landscapes of Mai Chau: Well known for its natural beauty, this valley is a great place for people who aim spend a night at a real homestay with local people, relax in beautiful settings and join in some activities such as walking from village to village or riding a bike along the dirt roads through lush rice paddies or simply sit in a local stilt house to enjoy the peaceful atmosphere of the village. Drive 120km from Hanoi to HoaBinh province, passing beautiful landscape full of limestone peaks and tropical forest. Arrive in the picturesque valley of Mai Chau around noon. Lunch at a White Thai ethnic homestay. In the afternoon, take a short drive to XaLinh village inhabited by H’Mong tribal people, and start a 1-2 hour trek to Hang Kia village situated on high altitude. Back to Thai ethnic homestay for overnight. 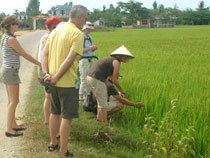 After breakfast, start your trek on a slope to reach Cun Pheo village. In the jungle, youwill frequently meet hill tribe people with baskets on their backs looking for precious medicinal plants. 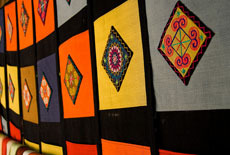 The trek will lead you through spectacular scenery and offer a chance to observe the traditional lifestyle of the locals. 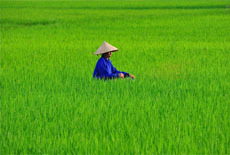 Enjoy a picnic lunch and walk through green rice paddies. Crossing a river, you will arrive in Cun Pheo village, home to White Thai ethnic people. Dinner and overnight athomestay. Wake up to the sound of a rooster. Start your trek in morning fog and savor a magnificent sunrise over the highland, which is when the sun fully reveals its beauty. En route drop by several White Thai ethnic villages where you can observe their traditional lifestyle and rice cultivation activities. 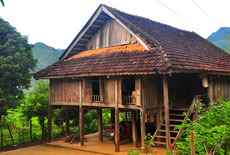 All Thai houses are built on wooden stilts, with their back to the mountain, facing the fields. In front of the houses are fruit orchards, barns and fishponds. This creates a peaceful, quaint and relaxing setting, perfect for refreshing your soul. Dinner and overnight at the homestay. After breakfast, depart for a light trek through the villages along the foot of the mountain toward Van Mai. The path is mostly flat so it is an easy walk. Arrive in Van Mai for dinner and overnight. After breakfast, you will go onathree-hour trek to Van village, a beautiful village populated by the White Thai. Lunch at a local house. In the afternoon, take a short walk through the village where the friendly people will welcome you. 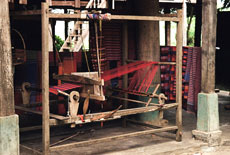 Communicate and discover their lifestyles and make sure to try your hand at weaving silk with an old loom. The rest of the day, you will have the chance to engage more in local life with a list of farming activities to choose from: land preparation, planting, harvesting,… (the activities depend on the season). 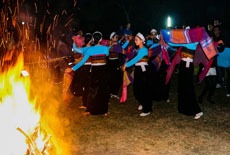 After dinner, you will enjoy a traditional dancing show and taste Ruou Can, the local rice wine. Overnight at Thai people's house on stilts. In the morning, cycle to the Nhot Village where you can see beautiful scenery full of rice fields surrounded by mountains. Stop on the way to meet locals and visit their houses. Cycle back to have lunch at a local house. In the afternoon, drive back to Hanoi. On the way, stop to visit Thay Pagoda, a renowned pagoda in the Red River Delta and a place of pilgrimage for Vietnamese people. Arrive in Hanoi in the late afternoon. Asiatica Travel’s services end here. Boat trip as mentioned in the program.